The Custom Industrial / Crane Pad is a laminated pad designed for use in heavy applications. The pad is made of a material that uses a specific blend of plastics in combination with patented ingredients to form an alloy of outstanding strength. Pads can be custom made in dimensions from 18" to 48" square or rectangle. Thickness of the pad depends on the size and application of required pad. Compression Tests results of the alloy used to manufacture these pads is in excess of 2000 pounds per square inch. 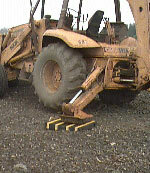 Crane Pad struts can break with improper usage. Our new construction method allows you to replace damaged struts easily and cost effectively. Super Dolly Pad, 4655 83 Street North West, Calgary, AB T3B 2R1. Tel: 403-238-6672; Fax: 403-238-6675.